Tag Archive | "Duboisi Cichlid (Tropheus duboisii)"
The Duboisi Cichlid (Tropheus duboisii) originates from the rocky coastal waters of Northern Lake Tanganyika, Africa. As juveniles, Duboisi Cichlids start out life with a jet black body with dozens of white spots that completely cover their flanks. As they mature, they lose their spots and develop a blue head with a vertical yellow or white band. Tropheus duboisi “Burundi” develop a white band just behind the pectoral fins, while Tropheus Duboisi “Maswa” develop a wide yellow band. The Maswa variety is debatedly the most popular with tropical fish keeping enthusiasts because of its noticeably wider yellow band. Male and female Duboisi Cichlids are identical in color however, there are subtle differences between sexes that may help you differentiate between them. Adult males are typically larger than the females and have a more turned up nose. Females have a greater slope and a more rounded nose. Adult males also tend to have a deeper body, whereas females appear more slim and streamlined. But, the only sure way to determine gender with Tropheus is by venting. Like other species in the Tropheus genus, Duboisi Cichlids are extremely aggressive towards their own kind and should be housed in large colonies of 10 or more individuals. 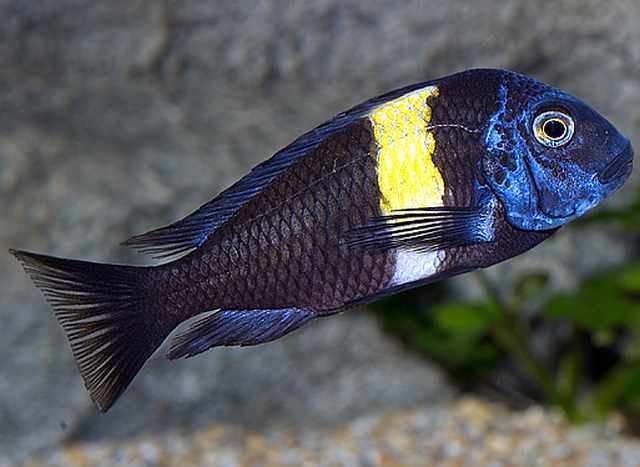 Although they are a very personable fish, they do best in a species specific aquarium. 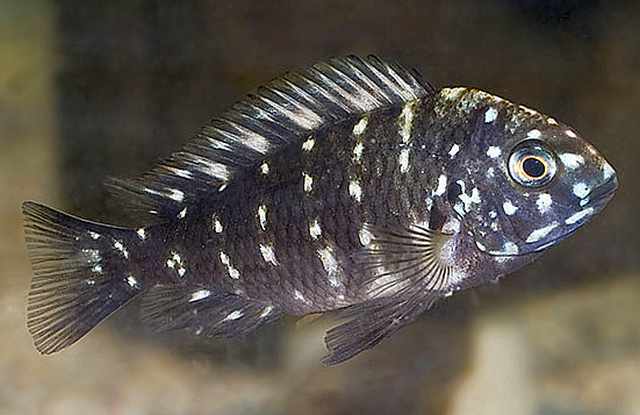 The Tropheus Duboisi Cichlid should be housed in an aquarium of at least 55 gallons with other smaller semi aggressive Tanganyikan or Malasian cichlids. A 75 gallon or larger tank is needed for a colony of ten or more fish of the same species. Aquascape the tank with plenty of rock caves where the females can hide and provide them with an aragonite substrate to help maintain the necessary alkalinity and high pH they require. These fish need clean, well filtered water to thrive in and should have a powerhead in their tank in addition to a good flter to provide moderate water movement. 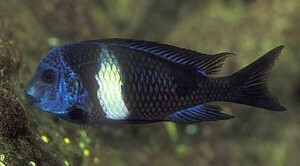 The Tropheus Duboisi Cichlid is a mouth brooder that is more challenging to breed than most other cichlids. It is a slow growing species that can take several years to reach sexual maturity. To increase the chance of spawning, keep 5 or 6 females in the breeding tank with one male or a group of 10 or more individuals. Never keep these fish in a 1:1 ratio. Males are very territorial and aggressive when trying to coax the females into spawning. To reduce aggression, set up a number of caves in the breeding tank for the pair to choose a breeding site from. After a female has spawned and is brooding her young, removed her from the tank to prevent the dominant male from harassing her. Incubation is dependent on water temperature and occurs anywhere from 24 – 28 days. The fairly large, active fry can be fed finely crushed vegetable based flake food for the first few months until they show interest in lettuce or Spirulina based foods. Unline some mouthbrooders, mouthbrooding females do not fast during incubation and will eat along with their tank mates. Tropheus Duboisi Cichlids should be fed a diet high in vegetable matter. Dried seaweed, Spirulina, vegetable based blakes or pellets, and fresh spinach or romaine lettuce on a feeding clip should be fed daily. The majority of Duboisi Cichlids are farm raised and are available for purchase when they attain a size of 1-1/2″ to 2″ in length.